If there’s a game maker who’s figured out a formula for iOS success, it’s NaturalMotion. The developer takes our insatiable love for sports and our primordial appreciation for bone-rattling hits and combines the two in a series of adrenaline-pumping games for the iPhone and iPad. The formula may sound simple; the games are anything but. NaturalMotion puts an emphasis on stunning graphical detail in its games—the kind of rich visuals that you wouldn’t imagine a handheld device could pull off. The characters move freely and smoothly in the games, which lean heavily on the built-in accelerometer found in iOS devices for their controls. Look no further than two recent NaturalMotion releases—Backbreaker 2: Vengeance HD and Icebreaker Hockey—to see those attributes on full display. Backbreaker 2: Vengeance HD is the iPad-only version to last year’s Backbreaker 2: Vengeance for the iPhone and iPod touch, which itself was a sequel to the well-regarded Backbreaker Football. As with the iPhone version of Backbreaker 2, the new iPad-optimized release puts you in the cleats of a running back trying to run the length of a football field while avoiding opposing tacklers coming at you with very bad intentions. On-screen controls let you spin and deke just as you could in the original Backbreaker; you also gain the ability to jump over tacklers or “truck” (duck under) obstacles, be they low-hanging bars or flying bodies. The accelerometer-based controls allow you to tilt your iPad to change directions. 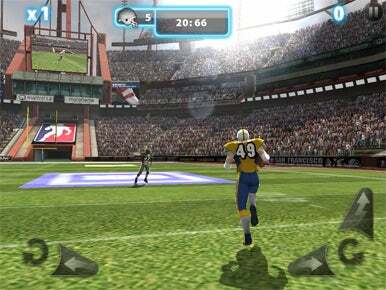 Backbreaker 2 also ratchets up the game’s Showboating feature—you rack up points for prancing into the endzone in a most unsporting manner—with a Super Showboat button that allows for even more high-scoring obnoxiousness. Turn the Tables: Backbreaker 2: Vengeance HD doesn’t just feature the ball-carrying mode of the original Backbreaker. You can also play the role of a defender and take out your aggression via some nice, hard tackles. 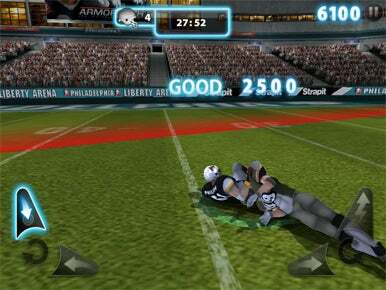 Backbreaker 2 added a new Tackle Alley mode to the iPhone version, which also appears in this iPad release. In this mode, you’re the hunter, not the hunted—you’ve got to chase down a ball-carrier, using those dekes, spins, and jumps to avoid any blockers who aim to stop you from reaching your intended destination. Owners of the original iPad will certainly appreciate having an optimized version of Backbreaker 2 for their device. But iPad 2 owners are in for a real treat. NaturalMotion designed the game to take advantage of the newer tablet’s processing power. That description, however, doesn’t do justice to the look of Backbreaker 2: Vengeance HD—it’s an amazingly intricate design. The football players cast realistic-looking shadows on the turf. When you’re facing certain angles, you see the glare of the sun. In one particular stadium, as you run, you’ll catch sight of a stadium jumbotron—which is showing a second rendered view of your run as it happens. When I met with NaturalMotion CEO Torsten Reil at last month’s Worldwide Developer Conference, he described these graphical touches as the sort of thing you’d expect from a console game. Believe me, that’s not just marketing talk. Graphically Different: From the shadows that players cast to the glare of the sun, the graphical touches in Backbreaker 2 impress on the iPad. And yes, that jumbotron in the upper left corner is showing a live replay of the on-field action. I’ve been a big fan of the Backbreaker series since the original. I love the over-the-shoulder view the game provides and the heart-pounding thrill when an enemy tackler suddenly lurches into your field of vision. The Tackle Alley mode in Backbreaker 2 extends the fun even further. I’ve also been critical of some of the on-screen controls for the Backbreaker games—it’s too easy to tap the wrong button—and that’s a problem that persists with this iPad version. I’ve often tried to jump over an obstacle by tapping the screen, but sometimes my tap will occur too close to the Accelerate button, and I’ll just wind up sprinting into the obstacle. Given the iPad’s ample screen space, I don’t think there’s a reason for the buttons to be placed that close together. That criticism aside, Backbreaker 2 is a fantastic iPad version of NaturalMotion’s original iPhone offering. If you own an iPad and you’re a fan of the series, you finally have an optimized version to call your own. And if you’re an iPad 2 owner, it’s almost worth buying the game just to look at the pretty pictures on your snazzy display. Icebreaker Hockey takes the Backbreaker Football concept and translates it to the frozen battlefield. You’re a hockey player in Icebreaker, trying to skate down the ice without getting checked into next week by any toothless goons. The spin and deke buttons from Backbreaker Football are at your disposal; tapping the screen brings your skater to a hard stop, which, when executed properly, will send your opponents sailing past you as you rack up points. Yes, the Showboating button makes the transition to Icebreaker as well—tapping and holding it makes your skater turn around and play to the crowd or ride his hockey stick like a horse. That sort of behavior gets you knocked into the boards in real life, but in Icebreaker Hockey, it helps you score more points. So Much for That Lady Byng Trophy: Icebreaker Hockey takes the Backbreaker formula and translates it to a hockey rink, right down to the showboating. You’re forever moving forward in Backbreaker Football. Not so in Icebreaker Hockey, which gives you the ability to circle around and back to cover the same patch of ice. It’s a great way to increase your point total by continuing deking past the same defensemen and skating over any bonus zones you might have missed on the first pass. It also illustrates how fluidly the graphics engine works in Icebreaker. There’s another critical difference between Backbreaker Football and this ice hockey-themed take on the game, though. It’s not enough just to make it from one end of the ice to the other; you’ve also got to get the puck into the net. That’s generally a matter of tapping a button to super-charge a shot past the goalie. (Delay too long on pulling the trigger, and the goalie—or a defenseman—will knock you to the ice.) The goal-scoring objective is certainly in line with the rules of hockey, but I feel like NaturalMotion could have more here to add to the challenge. That goalie is pretty sieve-like—fire a shot in a reasonable amount of time and it’s going in the net. I tested Icebreaker Hockey on an iPhone 3GS, and the game never lagged or stuttered. More impressively, I was still able to take note of some impressive graphics work even without the benefit of a Retina display. There’s a beautiful reflective quality to the ice that adds an element of realism to the game. That said, the nature of ice hockey surfaces—with their blue lines, red lines, and face-off circles—can make it difficult to spot the color-coded bonus zones NaturalMotion uses in its games. I didn’t have the same complaints about the onscreen controls with Icebreaker Hockey that I did with Backbreaker 2. Maybe it’s because the former game only runs on the iPhone and iPod touch in optimized form, and cramped controls are to be expected on those smaller devices. Still, I would occasional try to tap the screen to perform that hard stop, only to deke or spin instead. A bigger problem is the game clock that counts down how long you’ve got to complete a particular wave—the clock appears persistently in Backbreaker Football, but only pops up when you’re running out of time on an Icebreaker stage. It’s remarkably easy to not notice the clock if you’re too busy dodging and deking defenders. These are minor quibbles, however. Icebreaker Hockey is a great interpretation of the NaturalMotion formula in a brand new setting. If the developer’s football-themed iOS games tickled your fancy with their bone-crushing action, you’ll certainly enjoy this hockey-influenced offering.